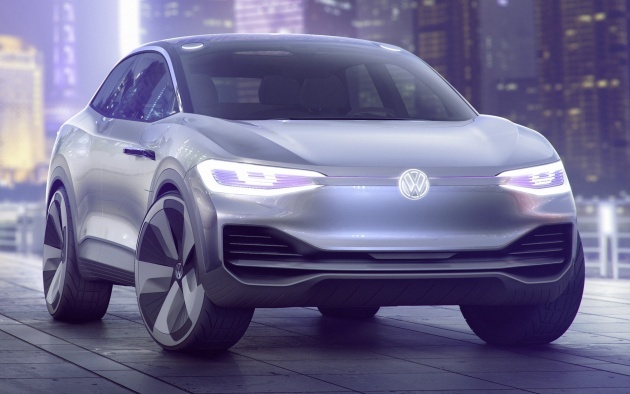 Another day, another coupé/SUV crossover – this time it’s Volkswagen’s turn to join the party with the I.D. 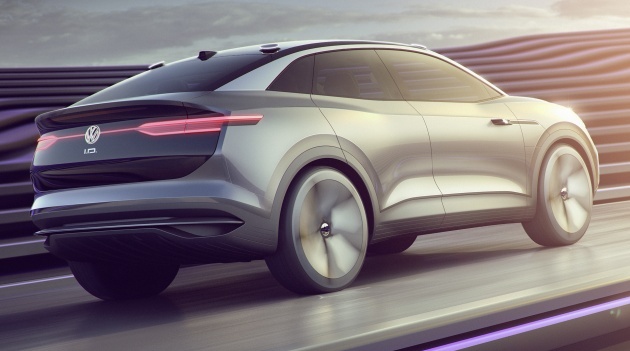 Crozz concept, the production version of which will form a key pillar in Wolfsburg’s electric car strategy. As with the previous I.D. and I.D. Buzz concepts, the Crozz carries minimal exterior adornment, with the exception of strong haunches above the wheel arches. The roof rails appear thin, being mostly painted black to blend in with the windscreen, panoramic glass roof and rear windscreen. The side cameras, which replace traditional door mirrors, add to the simple, clean look. Most of the visual drama is created by the LED lighting all around. The headlights feature C-shaped daytime running lights and five LED strips that create interactive, moving “eyes” – they enable the car to communicate with other road users in autonomous driving mode, and greet the driver as they approach the car. The light show also includes the glass VW badges that light up in blue and white, as well as a fine line of light at the front that sweeps from the badge towards the headlights. The roof ambient lighting and the roof-mounted laser sensors also light up; the headlights can even be set to blink at the driver as they come on. Finally, the DRLs are activated, signifying that the car is ready to drive. The exterior lighting changes depending on who is driving. In manual mode, the front graphic is lit up in light blue, as does the interior ambient lighting to help the driver focus; the headlights also grow narrower as speeds increase. In fully-autonomous I.D. Pilot mode, the lights switch to a magenta hue, and the headlights will “look” into the corner as the car turns. The “eyes” will also point towards pedestrians and cyclists walking by the side of the road to warn them of its presence, which does sound rather creepy if you ask us. 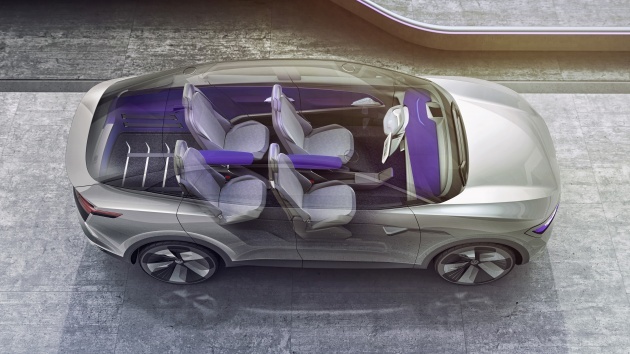 Inside, there’s a lounge-like “Open Space” concept, with interior space freed up by the compact electric drivetrain and floor-mounted lithium-ion battery. Four individual seats face the front, and the minimalist dashboard features a steering wheel that retracts in I.D. Pilot mode, as well as a central 10.2-inch touch tablet, a digital 5.8-inch Active Info Display instrument cluster and a electronic rear-view mirror. An augmented-reality head-up display projects information such as navigation directions between seven to 15 metres ahead of the car. Drivers can control various parts of the car through voice and gesture control, and there are also two capacitive sliders to scroll through menus, as well as control panels on the four doors. 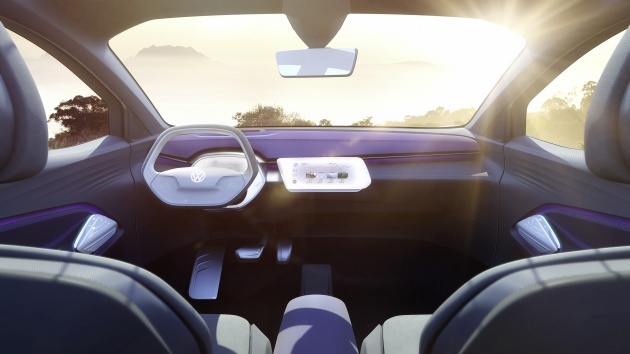 Other interesting features include CleanAir filtration, a Volkswagen User-ID and Digital Key that adapts individual parameters on board to the driver’s preference, and a delivery service that will send packages right into the 515-litre boot. Built on the same Modular Electric Drive Matrix (MEB) as the other I.D. concepts, the Crozz measures 4,625 mm long, 1,891 mm wide and 1,609 mm wide, making it 77 mm shorter, 56 mm wider and 47 mm lower than the Tiguan Allspace Volkswagen used as an example – while providing just as much space. Its wheelbase measures 2,773 mm long. Power comes from a 102 PS/140 Nm front electric motor and a 204 PS/310 Nm rear motor; combined, they produce a total system output of 306 PS. With an 83 kWh battery, the Crozz is capable of 500 km, and is able to be charged to 80% in just 30 minutes using a fast 150 kW DC charger. If only if Proton was taken over by VW, we Malaysian would have our own Proton fully electric/autonomous model by the year 2020. I would name it either Proton Elektra/Atomus/Núcleo. Yeah, then u pipu will bash P1 for dieselgate and DSGgate kan? Winliaolor!